When the semiconductor IC fabrication technology soon reaches less than sub 10nm levels from the present 14nm, the atomic behavior of semiconductor material gains more importance. The complex behavior of Ultra LSI (no more VLSI!) chip can not be understood by studying electrical properties based on the unit of physical dimension of the material, and general characterstics of the material. 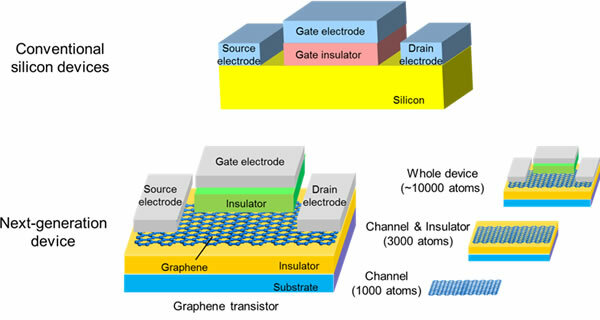 The new set of parameters based on atomic properties play a role to understand the electrical properties of silicon and many other compound semiconductor as well as other innovative semiconductor materials such as graphene and organic materials at scales even at 14nm and below. Some of the EDA vendors have already started designing chip design software by considering atomic behavior of the material. Synopsys supports VLSI designer to develop the transistor with TCAD modeling, that simulates the basis transistor at atomic level. While that is at the design-software application, there is also innovation going in utilizing supercomputers for designing the nano-switch by studing atomic behavior of the material. Fujitsu has shared its latest development in this technology. Fujitsu Laboratories said it has successfully simulated the electrical properties of a 3,000-atom nano device, which Fujitsu claims a threefold increase over previous efforts using a supercomputer. In nanotech devices, minor differences in atomic configuration causes major impact on the electrical properties of a device. 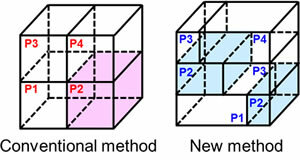 The method called first- principles method(1) is used to accurately compute physical properties at the atomic level to forecast electrical properties and it is presently limited to the order of 1,000 atoms, according to Fujitsu. Fujitsu claims it has now developed a calculation technique that reduces memory requirements while maintaining precision. Application at a 3000 atom scale have been made possible through a supercomputer using massively parallel processing. This technique is said to help in calculating electrical properties individual nano device components and also interactions between these components. The simulation by Fujitsu uses massive parallel computing technology developed by the Japan Advanced Institute of Science and Technology (JAIST) and the Computational Material Science Initiative (CMSI). Details of this technology are being published in the January 14 edition of the Applied Physics Express (APEX), the letter journal of the Japan Society of Applied Physics. Simulating a nano device's electrical properties accurately on a computer rather than through experimentation can make the development process quicker and less expensive. An effective way to do this is to derive the electrical properties from the first-principles method, which accurately calculates the behavior of each atom. But as the first-principles method requires a massive amount of calculations, applying it to electrical property forecasting is limited to models on the scale of 1,000 atoms(Figure 1). On this scale, only channel regions – the pathways for electricity – can be calculated. A simulation that would include interactions with thousands of adjacent electrodes and insulators – which are thought to greatly affect electrical properties – has been impossible. Fujitsu Laboratories has developed a computational technique that reduces memory requirements while preserving accuracy. Along with the use of a massively parallel supercomputer, this has made it possible to derive the electrical properties of a 3,000-atom nano device using the first-principles method. Simulating the electrical properties of a 3,000-atom nano device was accomplished in approximately 20 hours. The simulation uses a set of basis functions that represent the flow of electricity. Typically, increasing the number of basis functions enhances the accuracy in approximations of the actual electrical current, but it also boosts the amount of memory used for the computation. 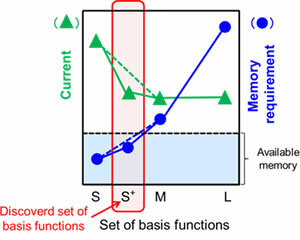 A detailed study of these results, from a physical-sciences perspective, led to the discovery of a set of basis functions that holds the required memory to less than the available memory (Figure 2). In performing the simulations, Fujitsu Laboratories used OpenMX(2), software for calculations with first principles that uses massively parallel technology developed by JAIST and the CMS Initiative. This program used an atom-partitioning technique (Figure 3) to limit the memory and communications demands, and a space-partitioning technique (Figure 4) to accelerate fast Fourier transform calculations, which are a key part of calculations from first principles. This combination of techniques made it possible to simulate the electrical properties of a nano device with 3,030 atoms, comprising both graphene and an insulating layer, in approximately 20 hours on a supercomputer(3). Simulation results with and without the insulating layer are shown in Figure 5. This technology, being capable of modeling the electrical properties of a 3,000-atom nano device, was used to discover the electrical properties of a nano device that included interactions with its environment, making a significant step toward the design of new nano devices. Based on development of ever-more massive parallel computing technology that has kept pace with the performance increase of computers, Fujitsu is pursuing larger-scale and more efficient calculations. Within the next several years, Fujitsu aims to achieve nano device design via computers through total simulations of nano devices (on the scale of 10,000 atoms). Rather than using experimental data and empirical parameters, this is a method that calculates physical properties from the basic laws of quantum mechanics that govern atoms and electrons. Using a 3,000-core Fujitsu PRIMEHPC FX10 supercomputer.